The world of digital marketing rarely involves taking straight, uncomplicated paths towards delivery. Every job in this game is, in itself, a handful of different jobs; each individual (and frequently it is a team of one) must wear an abundance of hats. So when you sit down at your desk in the morning, the idea of taking on a single identifiable task to keep you busy until the end of the day is rare indeed. Instead, each day becomes a mammoth task of multitasking: and only the true multitasking ninja will thrive! So how should you go about combining your multitude of tasks into a single, workable and sustainable game plan? The umbrella answer, of course, is scheduling. There is nothing heroic about rushing headfirst into an onslaught of disparate tasks, when just ten minutes put aside at the start of each day can help you work smarter and be a lot more productive. Making yourself a ‘to do’ list can reduce stress before you even get started. Think about dividing your day into identifiable blocks, and be disciplined about keeping to them. Don’t forget to leave space for breaks, and for regular chores such as backing up files and keeping accounts up-to-date – and allow yourself to start with a relatively short, easy task to avoid procrastination. 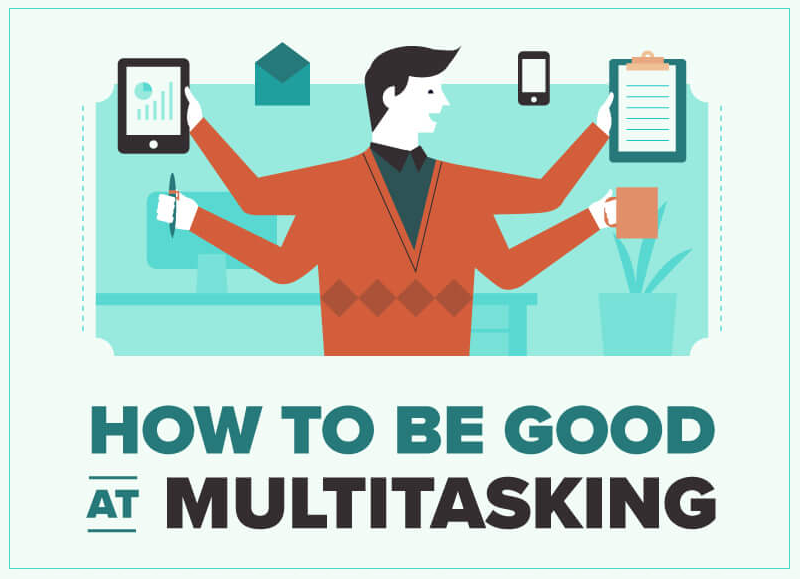 Multitasking isn’t for everyone, but if you’ve chosen a profession in which it is necessary then you can make things a lot easier for yourself by creating the idea better conditions to concentrate on those manifold tasks. That includes switching off connections to personal alerts such as Facebook and SMS, and delegating tasks to colleagues where possible. For a full rundown on how to multitask more effectively, check out this infographic. Applied wisely to your daily routine, these tips can turn you from a straggler to a streamlined multitasking ace in just a few hours.